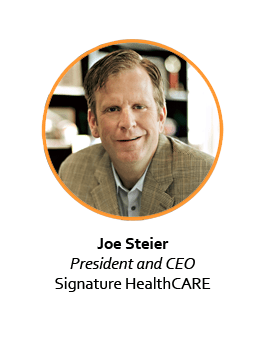 Joe Steier, III is the President & CEO and Co-Founder of Signature HealthCARE, one of the nation’s leading long-term care providers with 75 facilities in six states. The mission and vision of the organization is to “radically change long term care forever” through its three foundational pillars – Spirituality, Learning and Intrapruenership. SHC has earned many national accolades including Best Places to Work, Inc 5000, and the U.S. News & World Report, Best Nursing Homes list. The company also has launched multiple spins off organization including Silver Angels, Integritas, SHC Furniture Factory, Innovate LTC, while various numerous philanthropic endeavors to aid its own employees and the communities it serves. Signature helped catapult Louisville into the national spotlight as a leader in innovation in aging care after it partnered with the University of Louisville to launch the International Center for Long Term Care Innovation, a business accelerator dedicated to bringing new aging care products, services and technologies to market. Aging care is now among Louisville’s dominant economic clusters, a feat that has earned the industry and the city coverage in the New York Times, The Washington Post and other renowned publications. A Louisville native, Joe has two decades’ professional experience invested in health care. He has an insatiable appetite for knowledge and holds a Bachelor’s degree in Accounting from Bellarmine University, a CPA license, an MBA with Healthcare Emphasis from the University of Miami, and Masters and Doctorate degrees in Education from the University of Pennsylvania/Wharton School of Business while winning many personal leadership awards as well.